It’s a new month, yay. Hello February. This blog is a quick retrospective to January 2016. Well, in regards to my web site. tl;dr Last year wasn’t too great for me, and I had my mind set on giving my site a boost, which gives me a positive boost as well. This is a look-back at January 2016 by sharing a few little statistics. When I started blogging on January 1st, I really felt motivated. The weather was great, I had a moment of nostalgia and it was the boost that I needed to tell myself that I can do it. I set myself up to blog daily and see how it goes. Putting my focus on positive forward thinking rather than clinging on to the bad stuff from last year. And it worked. Statistics for a website are a little black magic, a little voodoo. You have to just trust the data, and you have to either specifically track and learn how to exclude search engines, block certain traffic etc. But I am not interested in that. I don’t prefer to track visitors. I even turned off sessions per user for the site and removed third party scripts like a FaceBook ‘Like’ button. I leave it to the hosting provider, who automatically gathers some data through the control panel. Having posted every twenty four hours, and linking to both Twitter and FaceBook, I’ve done basically the same for a period of time. This helps make it somewhat ‘fair’ for each blog post. Sometimes they’re posting just before midnight and then again just after midnight. While at other times they were posted before breakfast, and then not again until the evening the next day. Trying to figure out the time I prefer to write and share. But it did not seem to matter much for me, nor the visits. Okay, a little disclosure. A lot of the traffic is from search engines, scripts, and naughty malicious bots. A third of the traffic is caused by me. I am on the site a lot, writing drafts, reading my own content, updating things, working on the site, publishing new stuff, etc. So when I say 10,000 visits, it wouldn’t surprise me if only a third is real traffic. But, 10k is still more than 1k. One thing I noticed is that this month is certainly a huge boost in traffic compared to previous months in the last year. With the lack of content visitors had no reason to return and spend a few minutes finding something to their interest. But, to be fair, at the end of the day it is my site, and I write this for me. If nobody visits it, so be it. I will be equally content. Of course I really appreciate anybody that honestly enjoyed reading an article and getting a smile from it, or some help. I hereby invite you back. 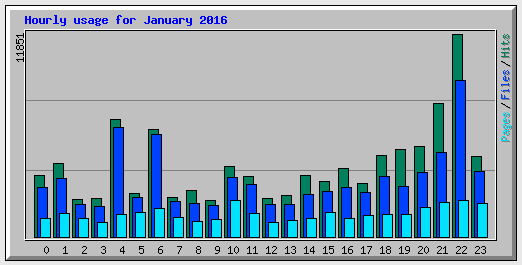 January statistics show that we’ve had over a 100,000 hits, from over 10,000 visits. Remember, a third of that is probably realistic traffic, maybe even a fourth. But still. Significantly more than the last three months’ average. This tells me it has been worth it. I’ve been way more active, and shared my articles more frequently, and more of my family and friends have found my content – as well as strangers through search engines and social networks. I am glad people enjoyed reading some of it. 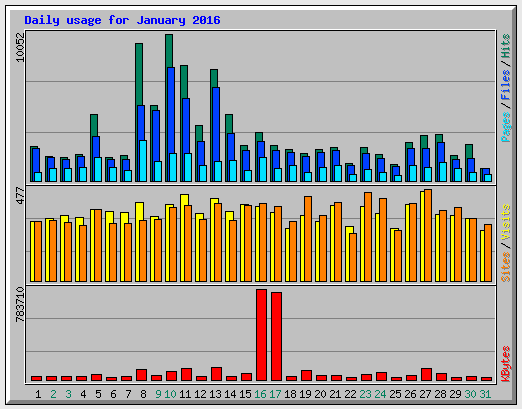 January had the least amount of site visits between 2am and 10am, but visitors peaked at 9pm and 10pm my time. This tells me a lot, and I could interpret this in many ways. Perhaps those nightly hours are best for writing drafts and preparing upcoming articles. As well as the best time to do site maintenance as it would affect the least amount of people. On the other hand, it might be a fun challenge to try and get some international traffic to peak during those nightly hours. And if those evening hours are the peak hours, I should probably not share new content afterwards, but publish fresh content before peak hours and share them with social networks so there’s something new to check out by all. Is it Bloggable, Finding Happiness in Nostalgia, Saving for a New Computer, and Offline and Offsite Backups. One thing to mention here is that a) these blog articles were posted in the beginning of the month, maybe they had more time to accumulate visitors, and b) five other articles got pretty darn close to having the same amount of hits. This sort of tells me that the top ten popular articles from January are doing equally well and that implies possibly a steady stream of return traffic. Oh a little fun fact. About five years ago the traffic showed that the majority was Microsoft visitors, followed by bots, and then Apple and Linux. In the last year, and especially the last three months this has completely shifted. Apple products (OSX/iOS) are dominating. Followed by bots, followed by Microsoft and everything else being a really low percentage. This pleases me greatly. And a less fun fact. Quite a bit of traffic is coming from countries I almost never hear about. Checking what they’re doing to the site, how they visit, it seems these are just malicious scripts trying to exploit bugs in known software, brute force attack login pages, etc. Which makes me believe I might as well block them in the near future. We had 198 scripts trying an average of 491 passwords to my honeypot page. It was fun to see they were not successful, properly misguided, and their passwords didn’t even get close. Before I close off the statistics part of this blog, and move on to mentioning some site updates and some content updates, I’d like to say thank you to the nearly three thousand unique visits to the site created by people finding my site through bookmarks, search engines, social networks, links I pasted to them, etc. While I do this for myself, I really do appreciate it that you read (and hopefully like) what I have to say on my blog. After a little system overhaul early January, I kept working on maintenance updates, including cleaning up some old posts. Pruning them, adding rich media to them, fixing typing errors, removing broken links, etc. I honestly had a lot of fun working on my site again. And while I didn’t really report back on the changes, the maintenance hasn’t stopped. 2006 through 2010 have been cleaned up, and in February I will work on cleaning up the posts from 2011->2015. There are some under the hood changes, some visual improvements, and I’ve made preparations to give better support for mobile (though, to be honest, if you load the site in Safari just click the ‘reader’ icon in the location bar and you get the content beautifully displayed for your iOS device). Anyway, I won’t bore you with more maintenance work, but I am making tiny changes and improvements almost every day to code, content, media, etc. While still preparing future posts. How long I will continue to do this just depends on what is all going to happen in 2016. I can only imagine that my frequency of posting will go down, less and less maintenance is needed. And I have some projects that require my attention this summer which might prevent me from writing new content. But for now, I am hoping February will be as fun to be on mrfloris.com for as it was in January. And to give you a taste of what might possibly be coming up next: iOS 10, Zen, Travel, Custom Guitar, Live Blog, Guest posts. And much more. So please stay tuned and bookmark this URL, the frontpage will always have the latest article in full, and the sidebar the most recent ones.